Chicahuaxtla Triqui (ISO code [trs]) is an Otomanguean language spoken in San Andrés Chicahuaxtla and eleven other communities located in the state of Oaxaca, Mexico (Elliott et al. 2016). There are two other Triqui languages. One is spoken in San Juan Copala (ISO code [trc]) and the other in San Martín Itunyoso (ISO code [trq]). Ethnologue (Lewis et al. 2016) estimates that TRC has 25,000 speakers, followed by TRS with 4,060 speakers and finally, TRQ with 2000 speakers. The demographic data reported for TRC and TRS date from 2007 while those for TRQ are from 1983. Table 1 lists mutual intelligibility figures among the Triqui languages as reported in Egland (1983). Based on survey data from the Summer Institute of Linguistics, native speakers of TRS understand approximately 74% of the Copala Triqui language and 77% of the Itunyoso Triqui language (Egland 1983; Lewis et al. 2016) while speakers of TRC comprehend 56% of TRS and 64% of TRQ. According to the survey, native speakers of TRQ evidence the highest mutual intelligibility coefficients and understand approximately 98% of TRS and 91% of TRC. Hollenbach (2008:2) states that the high intelligibility rate evidenced can be attributed to high levels of contact the Copala indigenous people have with those of San Martín Itunyoso because they travel to that region to sell their goods. (For more information regarding mutual intelligibility studies among the Triqui languages, see Casad 1974). 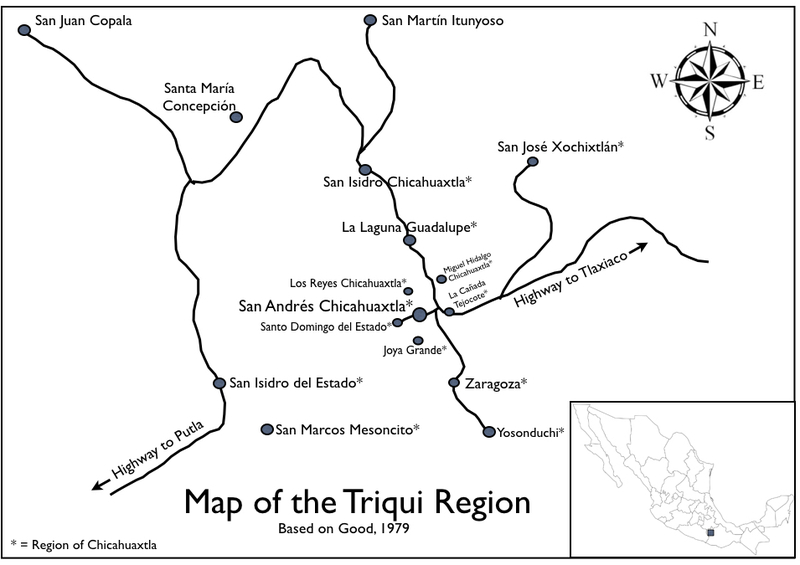 Figure 1 (adpated from Good 1979) is a map of the Triqui region and lists the major areas where the Triqui languages are spoken. The Triqui indigenous people live in the northwestern region in the State of Oaxaca. TRS is spoken in approximately eleven communities: San Andrés Chicahuaxtla, La Laguna Guadalupe, San Isidro Morelos, San Marcos Mesoncito, Santa Cruz, Zaragoza, Yosonduchi, La Cañada Tejocote, Miguel Hidalgo Chicahuaxtla, San José Xochixtlán, Santo Domingo del Estado, and San Isidro del Estado (Hernández 2013), in addition to other neighboring areas such as Los Reyes Chicahuaxtla, Barranca del Cuche, Concepción del Progreso and Joya Grande, the area where the legend is believed to have taken place in the text below. San Andrés Chicahuaxtla has an altitude of 2419 meters above sea level or approximately 7,936 feet. According to the 2010 census by the Instituto Nacional de Estadística y Geografía (INEGI) there are 1,120 inhabitants (592 women and 528 men) in San Andrés Chicahuaxtla, not all of whom speak TRS as a native language. Village leaders estimate that the population has fallen to 940 and is still in decline. Elliott et al. (2012) note that many of the Triqui indigenous people have left the village due to economic and educational opportunities of residing in Oaxaca, Mexico City or in the United States. Triqui families living in San Andrés Chicahuaxtla, Mexico City and other areas frequently use Spanish when speaking to their children. In addition, many Triqui males have married monolingual Spanish-speaking women who now reside in San Andrés Chicahuaxtla. Many of these women say that TRS is “too difficult to learn” and that they only speak Spanish to their family and friends (personal communication). Although language maintenance is an issue for the Triqui people of Chicahuaxtla, the pressure to speak Spanish is great due to the desire to gain educational and economic advantages associated with living outside of the village. Likewise, there are some native speakers of TRS who prefer speaking Spanish in order to avoid the social stigma of being indigenous. Although the elders, village leaders and teachers who speak TRS and who are natives of San Andrés Chicahuaxtla have made great strides in the conservation and maintenance of their language, many are dismayed by the increasing numbers of younger speakers who do not speak the language.